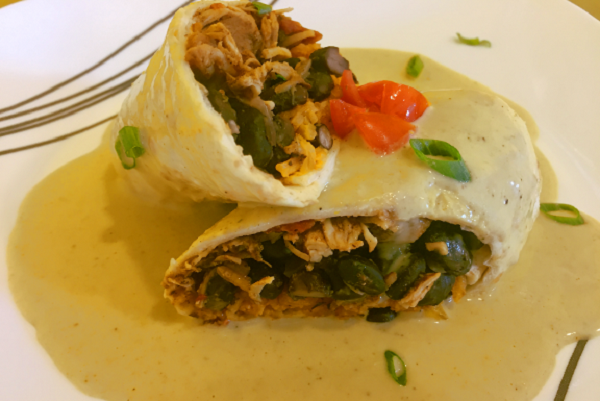 Shredded chicken, yellow rice and black beans stuffed into a flour tortilla, then baked until crispy and smothered with a green chili sauce. Flavor packed goodness, perfect any day of the week. Preheat oven to 400F. Warm up the chicken, rice and beans in microwave for 1-2 mins. Lay out each tortilla. Distribute chicken, rice and black beans evenly along center of each tortilla. Fold in the sides of the tortilla first, then firmly roll the tortilla. Place each rolled tortilla in supplied pan. Bake about 10-15 minutes or until golden brown. Reheat green chili sauce in the microwave. Pour over baked tortillas and serve with remaining rice and beans. 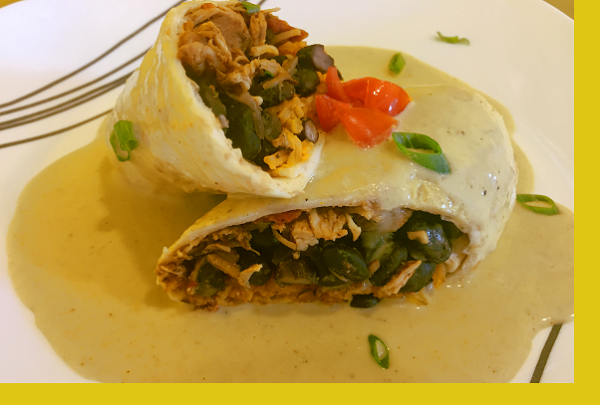 We are obsessed with these burritos!! They are so easy to prepare, filling, and delicious. The green chili sauce and homemade salsa push these over the top. Definitely one of our favorite Maria's dishes!! Maria's meals are always good. This one was just a little bland. Portions were huge, really enough for four people.